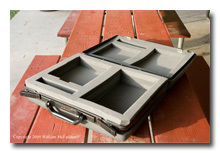 The K2 Travel Kit is too large and heavy for easy transport over great distances via foot or bicycle but works well for travel via motorized transport. Now that I have the KX3 Travel Kit, it's likely the K2 Travel Kit will see fewer outings. 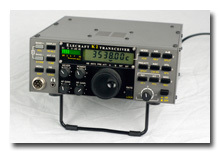 The heart of the K2 Travel Kit is an Elecraft K2 equipped with the KSB2 (single-sideband), K160RX (160-meters plus receive antenna), KAT2 (internal QRP autotuner), KAF2 (audio filter/clock), KNB2 (noise blanker), modified KBT2 (internal battery), and K8FF FingerDimple options. The K2's all-band coverage, outstanding receiver performance, CW and SSB modes, generous feature-mix, small size and low weight, and battery-friendly design make the K2 an extraordinary field-radio. 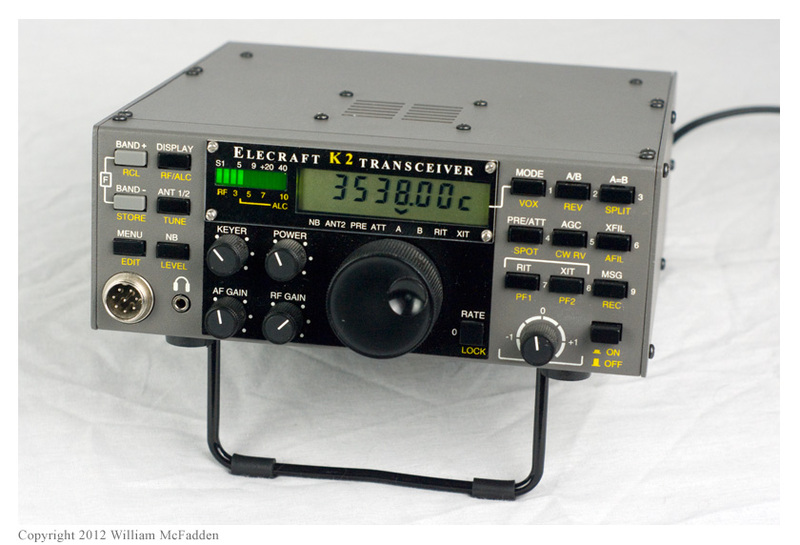 This K2 is the same transceiver that serves so admirably as the main rig in my hamshack. I have installed my own variation of the KBT2 internal battery in my K2. 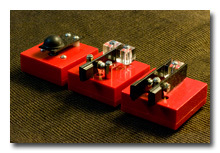 A KBT2 bracket secures a 2.2Ah sealed lead-acid (SLA) battery within the K2; the battery voltage is taken through an inline-fuse to a rear-panel Anderson Powerpole pair (photos: 1 | 2) and a short jumper takes the battery voltage from the Powerpoles to the K2's coaxial power connector. 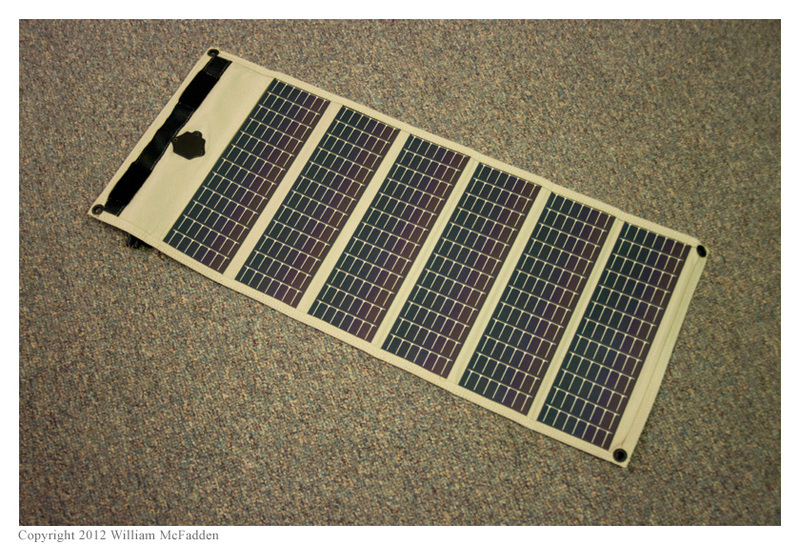 This scheme allows me the flexibility while in the field to power my K2 with the internal battery while simultaneously charging the battery with a small solar panel and charge controller. 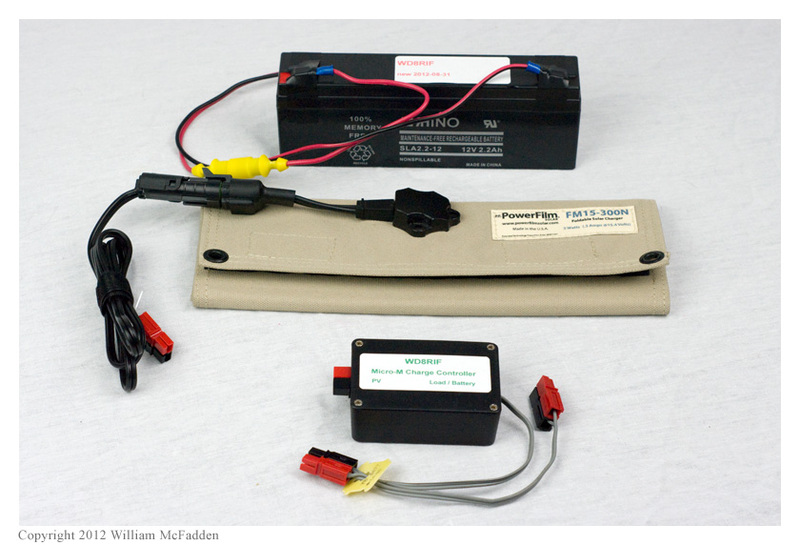 The 2.2Ah SLA battery was one I had on-hand; eventually, I will replace this battery with the proper PowerSonic PS-1229 2.9Ah battery. 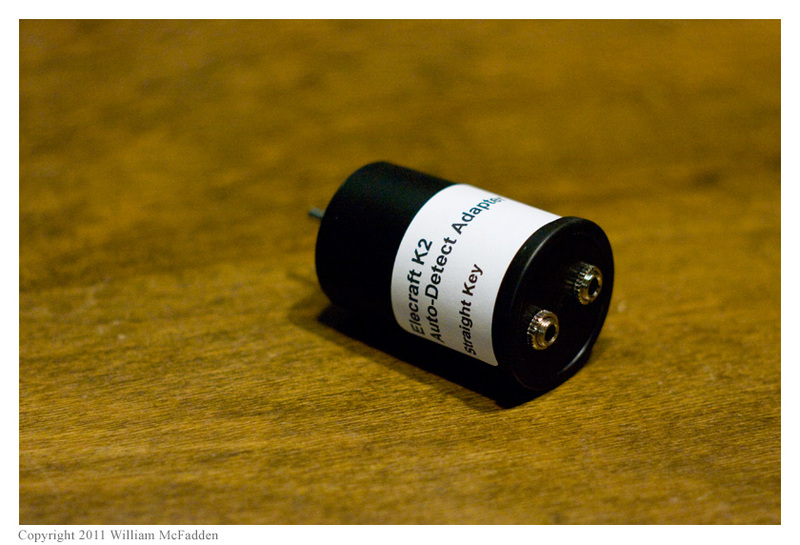 When necessary, I power the K2 with an external 5Ah or a 12Ah battery. The 5Ah battery	fits nicely within the Samsonite case; the 12Ah battery is carried externally to the case. 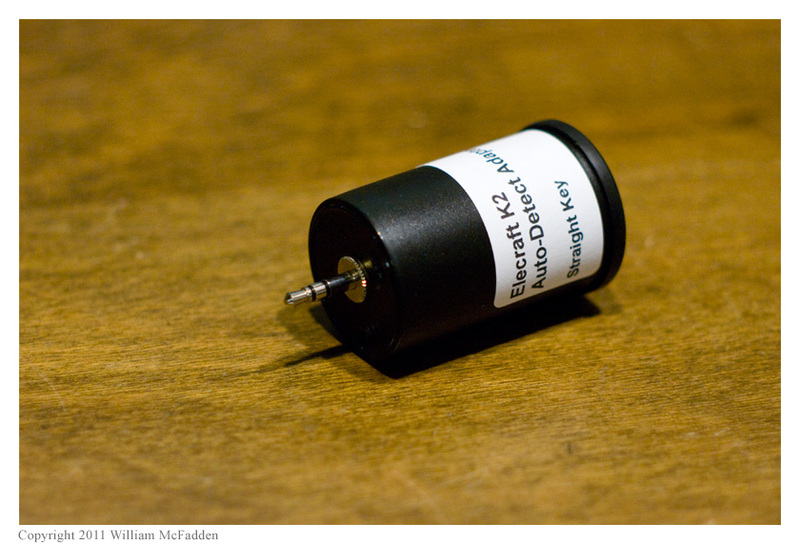 UPDATE: With the acquisition of the Elecraft KX3, I've removed the 2.2Ah SLA battery from K2 in order to use the battery with the KX3 Travel Kit. 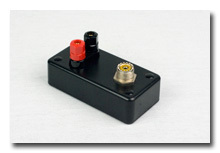 Of course, the 2.2Ah SLA battery is still available to use with the K2 as an external battery. I also have a pair of glass-and-aluminum 5-watt photovoltaic panels. One of the panels is an inexpensive but relatively large (approx. 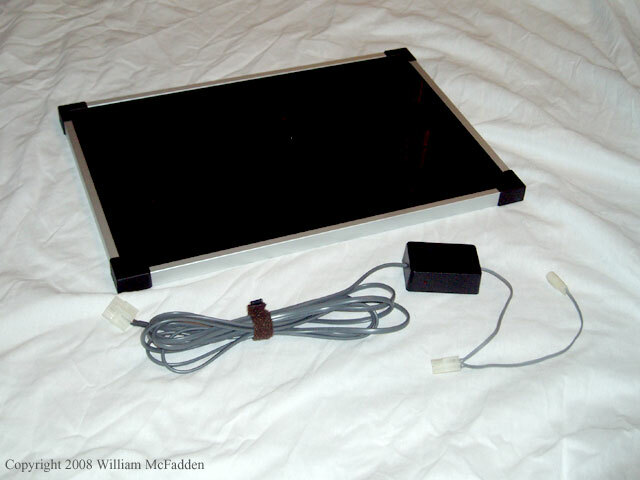 12"x18") thin-film panel (photo) I purchased new at Harbor Freight. 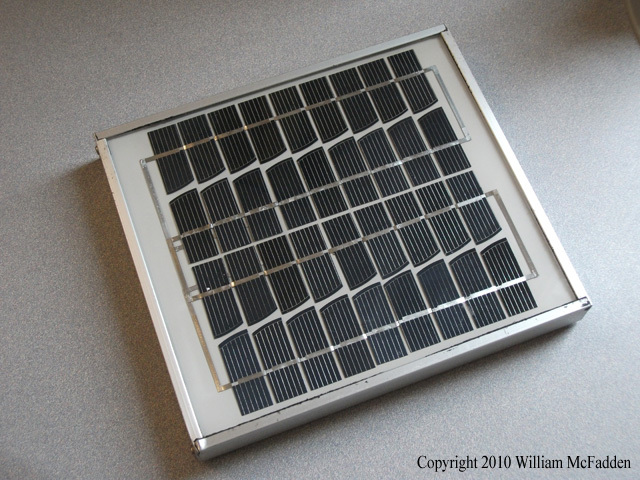 The second panel, an old Hoxan SP 5, is a polycrystalline panel (photo) and is much smaller (9"x10"). I purchased this panel used at a hamfest but it still provides rated voltage and current. The Micro-M charge controller is configured to work with any of my panels and to allow me to charge a battery while the battery is simultaneously powering the rig. 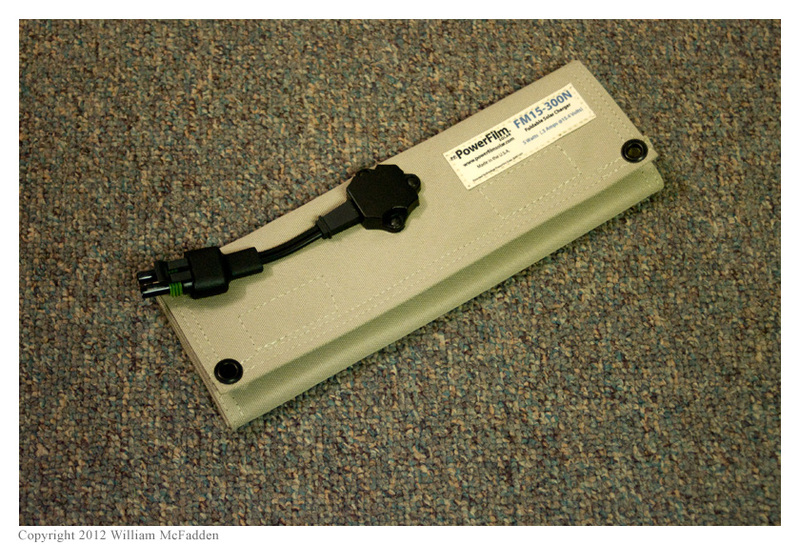 My venerable 3.5A portable switching power supply having died, I purchased a Mean Well 15v 4.4A (#P66A-4P2J) switching power supply (link) which opens with a screwdriver and is internally adjustable over the range of 13 volts to 16 volts. This power supply is slightly smaller than the my original one and easily fits in the Samsonsite case. I'm a little bit disappointed with this supply because it doesn't regulate well with a very small load; this means I won't be able to use it as-is to safely float-charge a gel cell battery. I have added a hefty diode on the output and may eventually build an adapter that will provide a suitable load and current-limiting to allow me to use this supply to charge a battery. This power supply seems to be very quiet, RF-wise, although I have added ferrites to both the input and output leads, just in case. 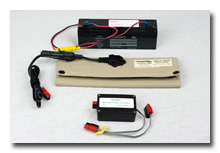 I generally carry the A/C power supply in the K2 Travel Kit only for hotel-type operations. I had mistakenly thought the K2's rear-panel DC socket was a 2.5mm x 5mm coaxial connector and had ordered a nice 24", 18AWG cable with the appropriate molded-on coaxial connector from Mouser (link; part number 172-4202). This cable works well enough but I've since learned that the K2's DC socket is actually a 2.1mm x 5mm coaxial power connector, so when I need to make a replacement power cable I will look at Mouser for a cable with a connector of this size. 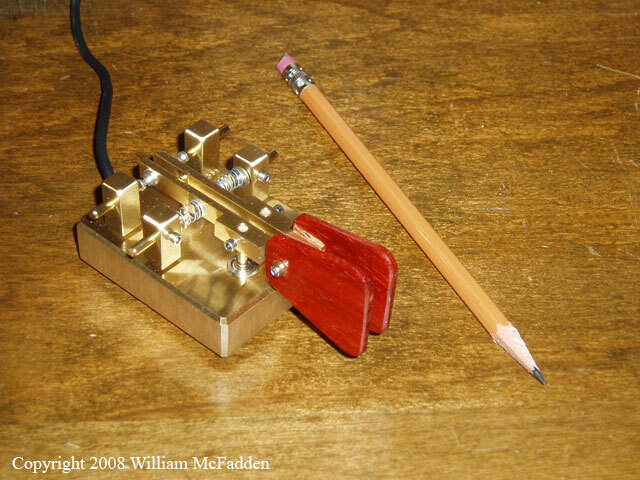 In the fall of 2012 I added the KAT2 internal automatic antenna tuner option to my K2 in order to reduce the weight, size, and complexity of the K2 Travel Kit. 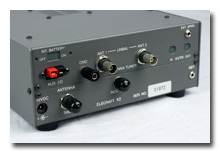 This wide-range internal antenna tuner is fully integrated with the K2 user-interface and should provide great flexibility regarding deployment of field-antennas. 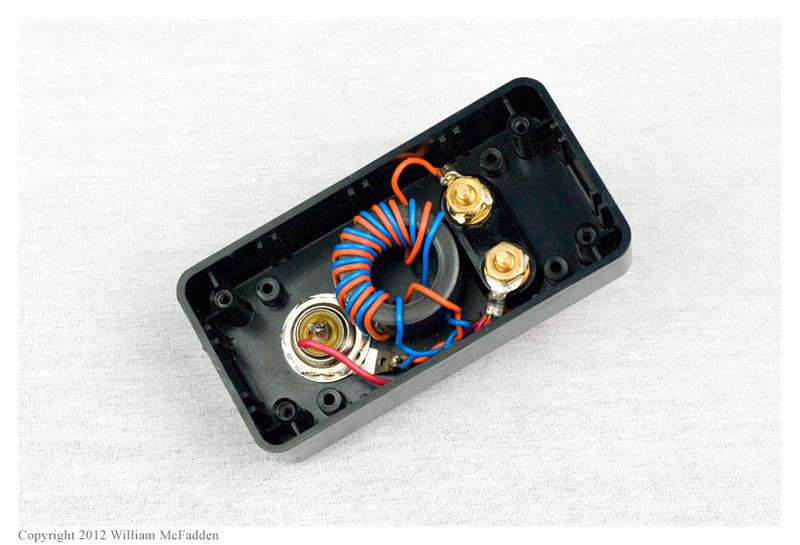 I built a 4:1 iron-core balun (photos: external | internal) to use with balanced antennas and end-fed wires. 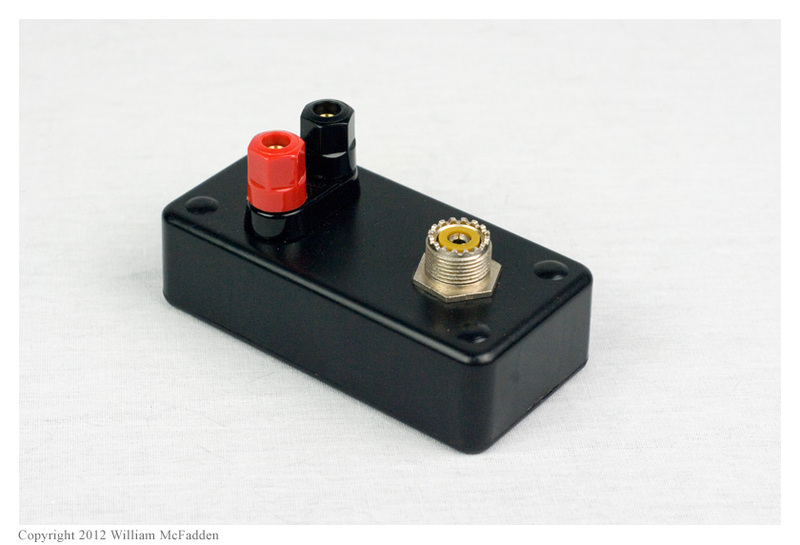 I may replace this with a less-lossy air-core balun at some point. 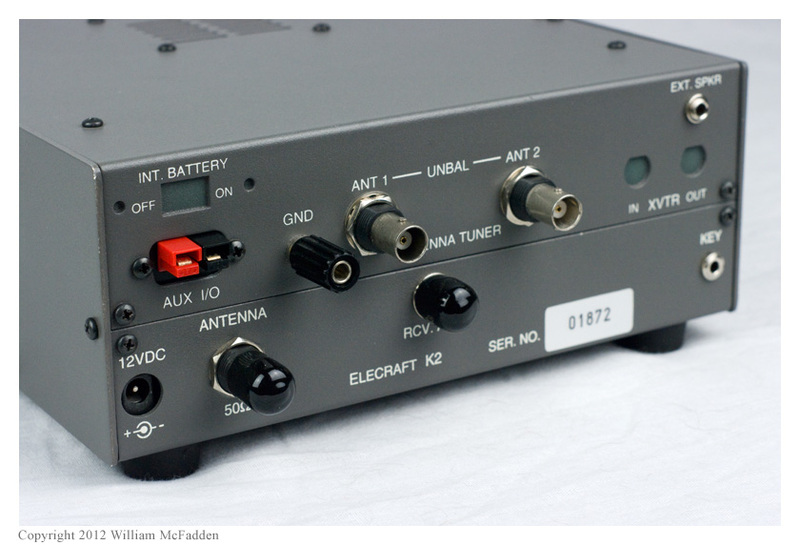 Prior to the installation of the KAT2 autotuner, I carried an LDG Z11 QRP autotuner in the K2 Travel Kit. This wonderful little autotuner worked very well in the field and LDG's customer service is second to none; however, having to carry the external antenna tuner, a power cable, and two coax jumpers added weight and complexity to the K2 Travel Kit. 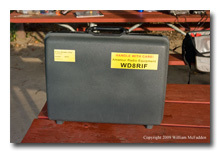 The descriptions of field-deployable antennas are now located here. 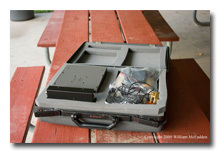 Some of the described antennas will travel within the Samsonite case; others are carried externally. The K2 has an excellent built-in memory keyer so I generally don't carry an external memory keyer with the K2 Travel Kit. 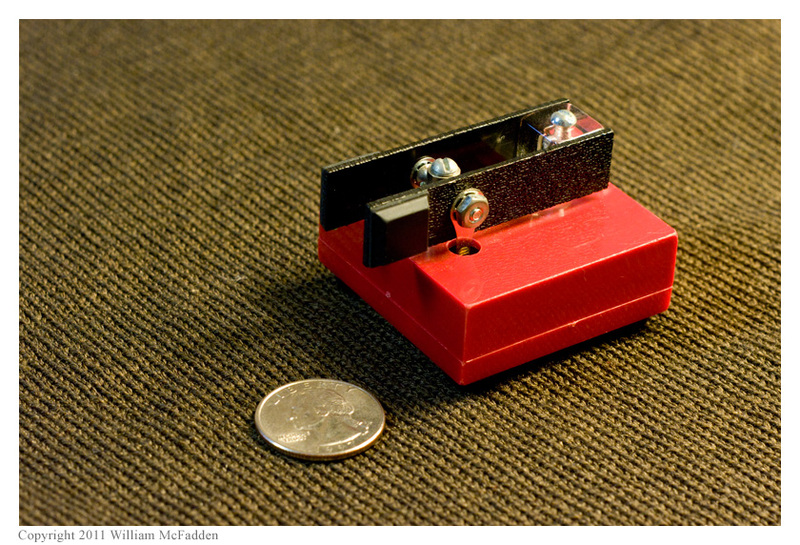 To key the K2 while afield, I previously used either a beautiful brass-and-rosewood K8RA P-2jr iambic paddle (photo | link) or a lightweight Whiterook MK-44 Pocket Mini Iambic Paddle (photo | link). 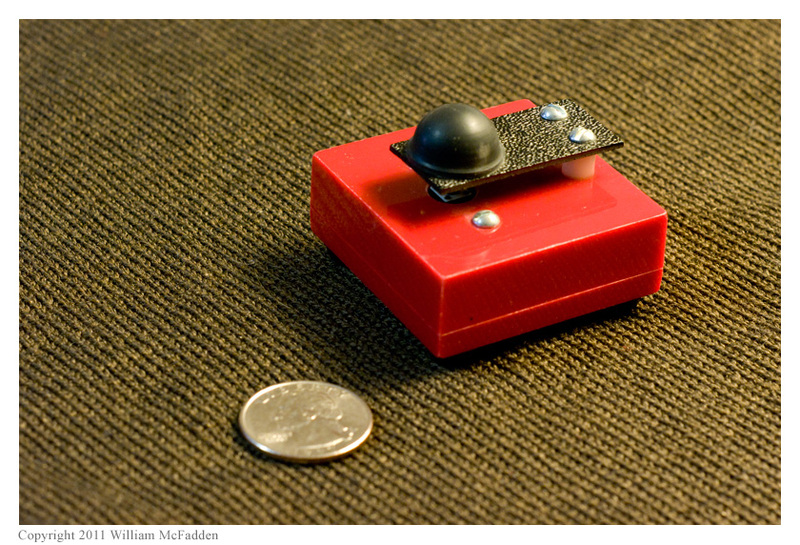 Having given up on iambic keying, I now use a lightweight Whiterook MK-33 Mini Single Lever Paddle (photo | link) when keying electronically. The MK-33 has a surprisingly good feel for such a simple and inexpensive device. 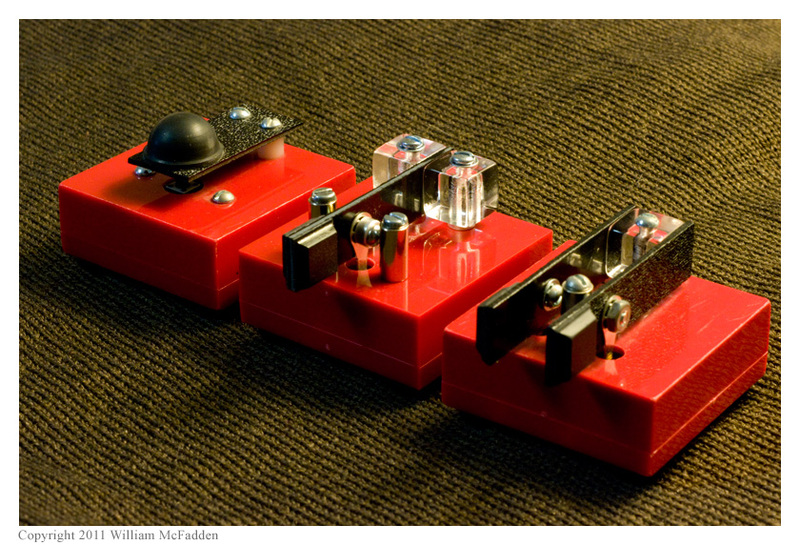 I've come to realize that when wearing gloves, as I almost certainly will be doing during the "Freeze Your B___ Off" events (link), a straight key would allow me to send better CW than would a keyer paddle. 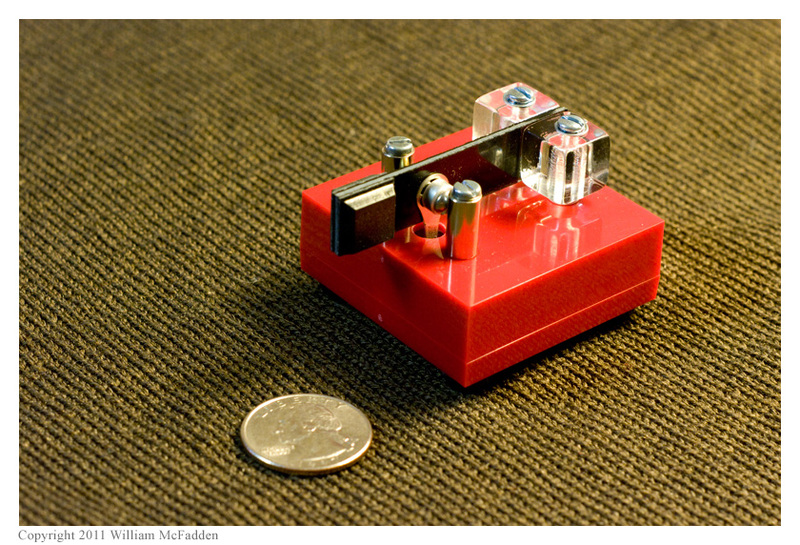 In this situation, I will use my Whiterook MK-22 Pocket Mini CW Key (photo | link). UPDATE: I used the key-adapter during the 2012 "Freeze Your B___ Off" event (report) and it worked very well except for one problem: with the adapter in place I was unable to deploy the K2's tilt-stand without applying stress to the K2's key socket. Currently, I carry an extension cable to solve this problem but may eventually replace the adapter's stereo plug with a short pigtail. My K2 came to me configured for use with a Kenwood microphone but it didn't come with a microphone. Since I already had an ICOM HM-12 microphone, I have reconfigured my K2 mic-jack for use with ICOM microphones. At this point, SSB operation is of very little interest to me. If this changes, I will consider getting a Heil Handi Mic HC-5 (link) or the less glamorous but far less expensive MFJ-290K; with either mic, I will return my K2 to the simpler Kenwood microphone configuration. 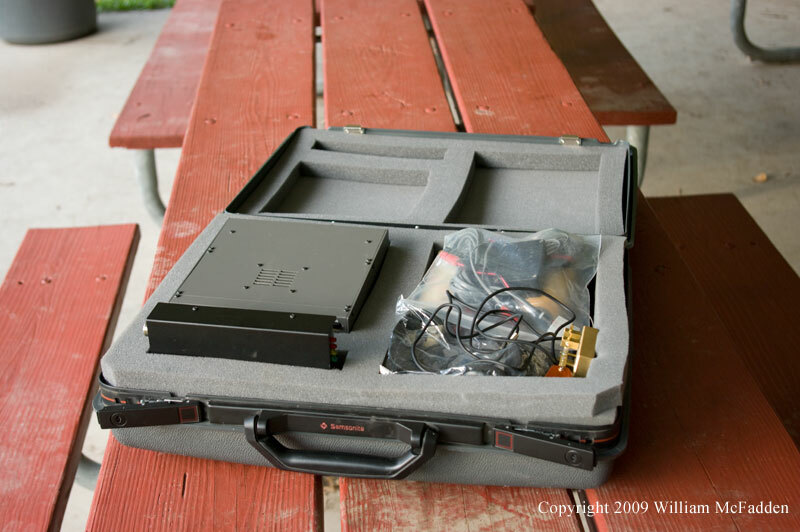 The case is a decades-old, hard-sided Samsonite equipment case that was salvaged from a dumpster in the early 1990s (photo); the case originally held a professional-grade video-camera. 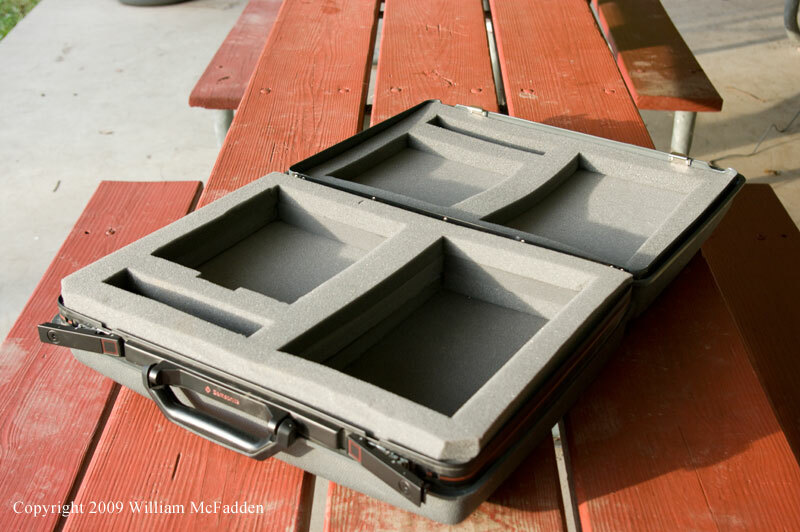 I cut foam sheeting material to securely protect the K2 and sundry items within the case (photo). 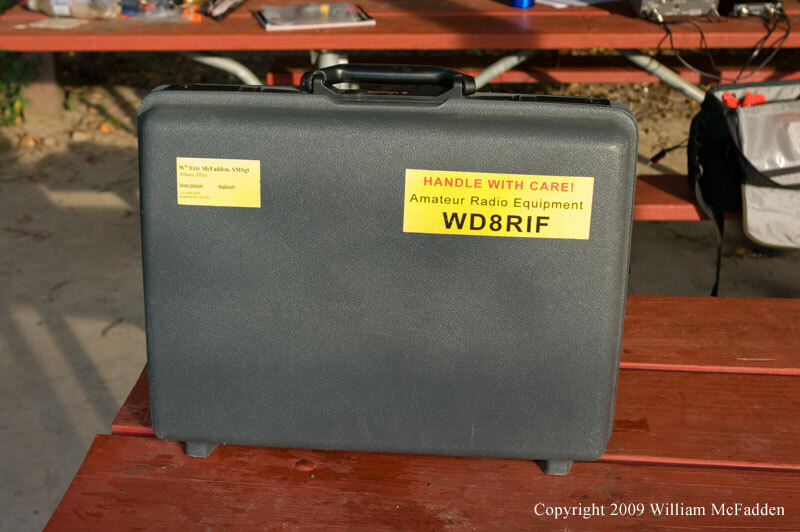 I have printed the "operating" portions of the K2, KSB2, KAT2, KAF2, KNB2, and K160RX manuals; these, along with pencils, log forms, paper for CW copy, and a world map are carried in the Samsonite case above the foam in the lid. The K2 has a built-in speaker but I prefer copying CW through headphones. I carry a pair of surprisingly-good-sounding "Movies 2 Go" headphones in the K2 Travel Kit.